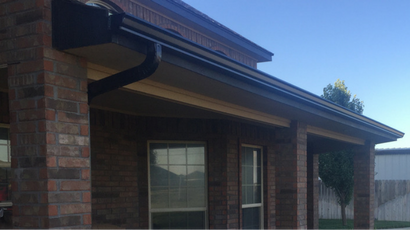 Continuous Gutters or Seamless Gutters offer a stronger/better material for moving water off of the roof to a optimal location. Over a 50' span, continuous gutters take away 4 potential leak joints that sectional gutters would have. With several elbow and downspout designs, NVES can custom locate every downspout for the best drainage/curb appeal. Many sectional vinyl gutters get brittle over time due to sun exposure. They also have joints that will begin to leak. Vinyl gutters do not offer the multitude of color choices that we offer. After the initial phone call, we will then come get a custom measurement to order the correct amount of materials. We will also go over downspout locations around the home with the customer and answer any question they may have. 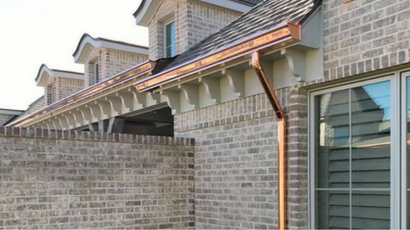 Once the order comes in, we will agree upon a time that is good with the customer to custom install the gutters and downspouts. We will then do a “walk a round” with the home owner to ensure the job meets with their approval.